“We want to empower design enthusiasts,” says Mat Sanders of Consort, the studio–turned–highly customizable furniture line he co-founded with his partner, Brandon Quattrone, that gives customers creative control. The two ﬁrst met on a Brooklyn rooftop in 2012 the night before Sanders, a longtime digital decor editor, was headed to Los Angeles to launch the lifestyle site MyDomaine. “I was immediately enamored with him and his effervescence,” says Quattrone. So much so that he quit his job as an architect at SoulCycle to join Sanders on the West Coast. Within a year, the duo was already collaborating on interiors projects: a mountain retreat in Telluride, Colorado, and a musician friend’s home in L.A.’s Los Feliz neighborhood. By late 2013 they decided to make it official, and Consort was born. “We deﬁnitely have a nonlinear trajectory, but I think that’s what makes what we do a bit different,” explains Quattrone of their professional path thus far. A combination of his minimal sensibility and Sanders’s fashion-forward approach has attracted interior design clients ranging from actress-entrepreneur Jessica Alba to hairstylist and Ouai founder Jen Atkin. Amped-up pastels and Cubist accessories create a successful pairing. “There’s a modern take, but it’s also casual and comfortable,” says Quattrone of the home. Despite the success, the duo recently started phasing out high-proﬁle residential projects and brick-and-mortar outposts in favor of focusing on their line. Now available only at Consorthome.com, the 44-piece collection channels French modernism through L.A.’s laid-back lens. Each style is shown in its most basic form, alongside anything-but-standard options of color, hardware, fabric, and size. Clearly, they’ve found the right formula: Playing with cameo pink velvet, matcha green linen, and dozens of other materials and ﬁnishes is hugely helpful for anyone couch shopping (and habit-forming for those who are not). The couple’s Larchmont Village loft is the ultimate expression of the polished Cali cool they are known for. After spending night after night perusing Zillow, they zeroed in on the home of their dreams—an open, bright, and airy space that is in walking distance of their go-to coffee and brunch spot and neighborhood Italian joint. Texture (brass, velvet, glass) and color (peachy pinks and saturated hues grounded by black) unify the space. Concrete ﬂoors, huge windows, and a balcony that Quattrone describes as “larger than most NYC apartments” only upped the appeal. “We knew it would be easy to do our thing here,” says Sanders. That meant ﬁnding a balance of their personal styles. Sanders lives to add, add, add, while Quattrone is constantly trying to scale back. “We’re always drawn to different things, so it creates a fun mix,” says Quattrone. Moments of calm are punctuated by the odd playful detail, like the hammerhead mounted over the dining table and life-size brass palm tree in the meditation room—an essential for the couple. In life as in work, a healthy dose of irreverence keeps things interesting. This is perhaps best summed up by the gallery wall where high-low pieces hang from ﬂoor to ceiling, including the typically off-limits closet doors. Quattrone kicked off the grouping by giving Sanders a large-format print of a rib cage in high-contrast black, white, and gold from L.A.-based Natural Curiosities. “People always comment on it when they come over and say, ‘I never thought I would like something like that, but now I’m rethinking everything about myself!’” says Sanders. Since then their collection has grown to encompass a photograph of a gay pool party from the 1970s and a friend’s painted interpretation of an Instagram post of Sanders dressed up as Iris Apfel. With the demands of a new business pulling them in a million different directions, making the loft a chill zone is a priority. “L.A. has really gotten into our souls,” says Sanders. 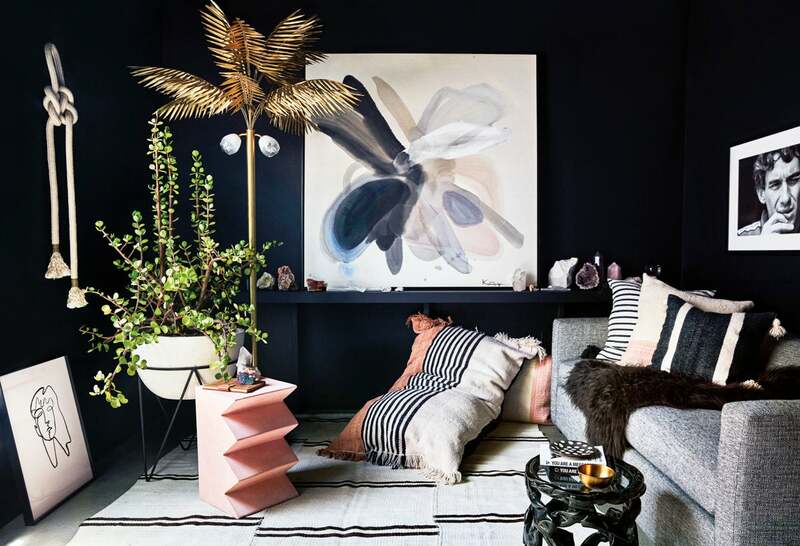 “We love a home that allows us to breathe and unwind.” They retreat to their newly minted meditation room—a former spare bedroom now decked out in graphic accents and a selection of crystals—when they need to reboot. And the couple’s mindfulness practice helps keep Consort’s mission in sight: “It’s about getting together and creating some magic,” says Quattrone.